This feature matrix shows you what each plan offers. Each feature is managed in real time from your domain admin panel. 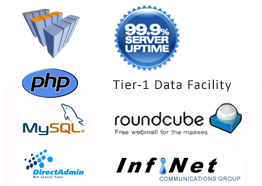 The free hosting package provides you the hosting essentials that every site requires. The Budget plan has every feature as the premium plan, making it an exceptional value for the price. The Premium plan has all the space and bandwith that you need for a large and/or high traffic site. * Unlimited Bandwidth. We believe our clients should have all the resources necessary to build a great online presence. To ensure that all customers enjoy high speeds we ensure that Unlimited bandwidth will accomodate 99.95% of all our customers websites.